We have left the Seine and are now on the Yonne River. 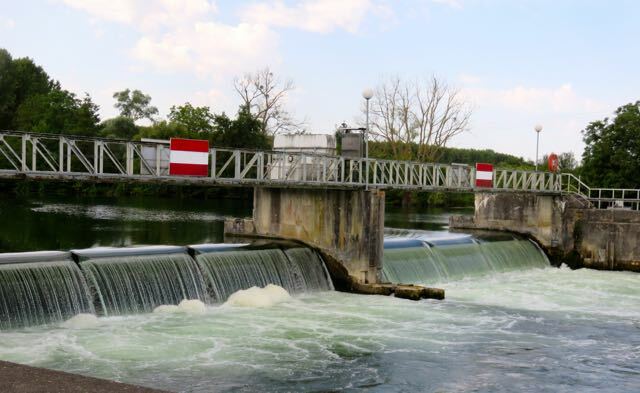 The Yonne is smaller than the Seine, but the easiest way to tell we are on a new liquid highway is the locks. 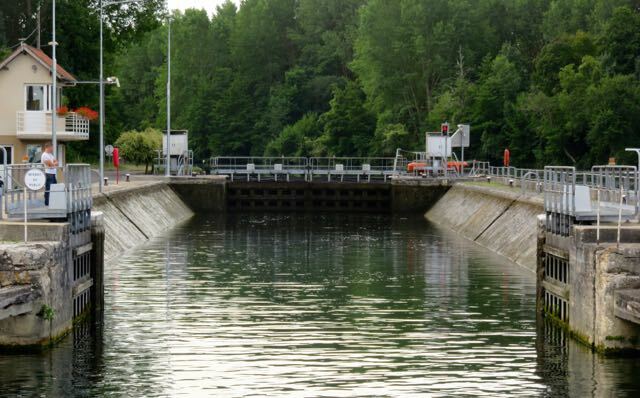 The locks on the Yonne have slopped sides and are absolutely miserable to use. We enter the lock. Throw a line to the lock keeper, and he places it on a bollard. I’m not sure why we bother, as the line remains completely slack while the lock is filling. With the water swirling around us it is my job as the pilot to keep Rabelo in the center of the lock. It takes a lot of concentration and effort. All they had to do was build the locks with vertical walls like every other lock in the entire world. A lock with slopped walls. Just to make things interesting they placed these dams right next to the entrance to the locks. We stopped in the town of Sens, and moored Rabelo against two giant steel posts that had been driven into the riverbed. The French call them Dig Dabs, and they are free to use. Unfortunately sometimes getting off the boat can be a little tricky when moored to a Dig Dab, but we always manage. 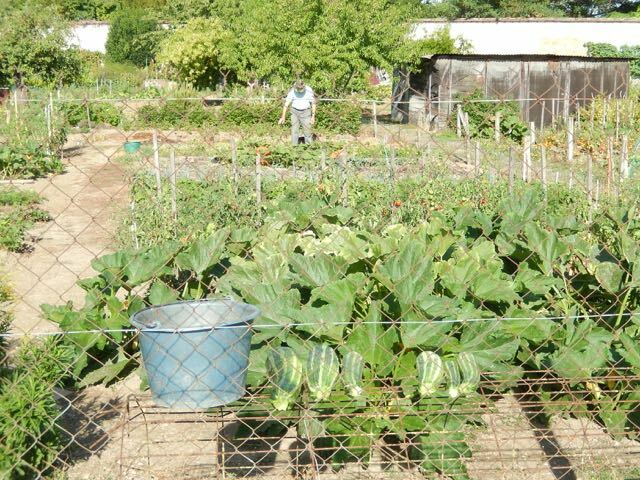 Right next to where we were moored was a public vegetable garden. Lisa and I climbed off Rabelo, and walked over to admire some zucchini next to the towpath. There was a man tending his garden and he happened to notice us. He didn’t speak a word of English, but he did hand us two fresh zucchini squash. It is those special interactions with people that form our most vivid memories. Lisa having to climb off Rabelo. The man in the background gave us two of these beautiful zucchini squash. 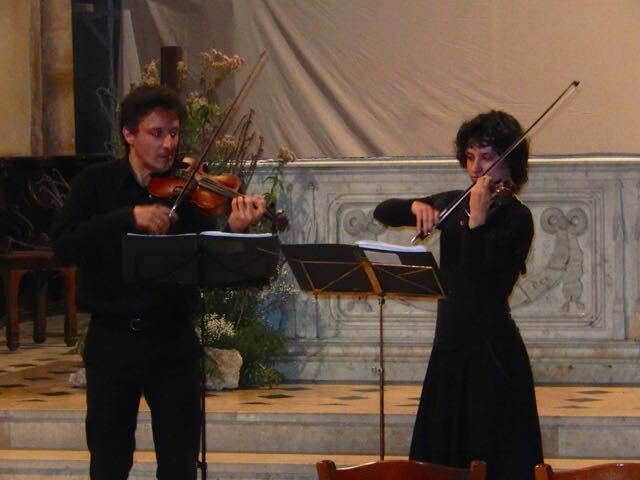 While in Pont surYonne we attended a concert at the church. From Sens we continued up the Yonne to Joigny. 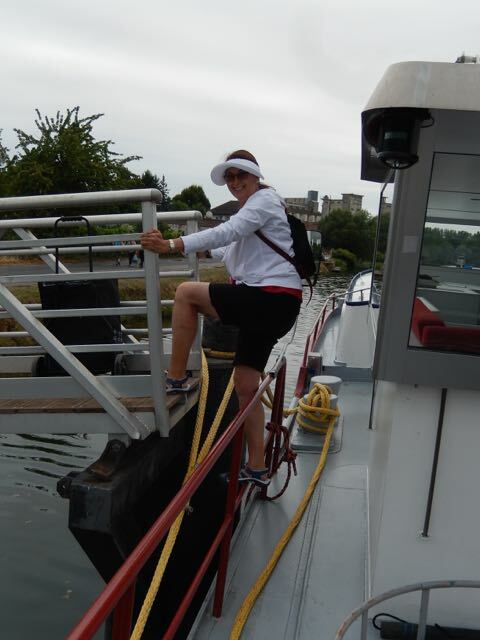 On rare occasion finding a mooring for a barge the size of Rabelo can be a challenge. We didn’t have a problem finding a place to park, but another barge our size did. The skipper of Adonis asked if he could side tie to us. Of course we said yes, and the next thing we knew we were sharing a bottle of wine on his boat. That’s one way to make friends on the river. The next day we had reservations at the restaurant A la Cote St. Jacques. They even had a dock in front of the restaurant, so the day of our reservation we moved Rabelo. The weather had turned unusually hot, but we were on a river that was calling to us. 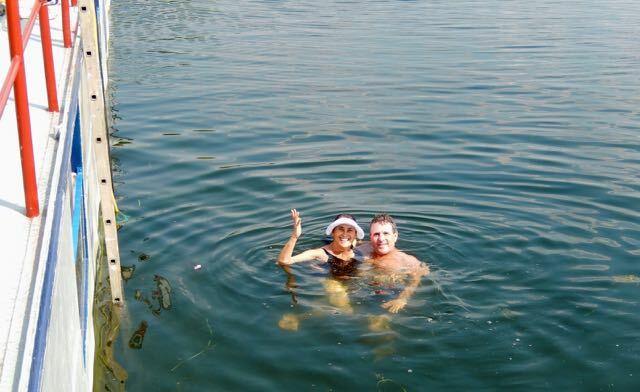 The water was just too inviting so Lisa and I went swimming. The temperature was perfect. Afterwards we took a quick shower, got dressed, stepped off the boat, and went to dinner. Whenever we go out for a nice meal we always order wine. 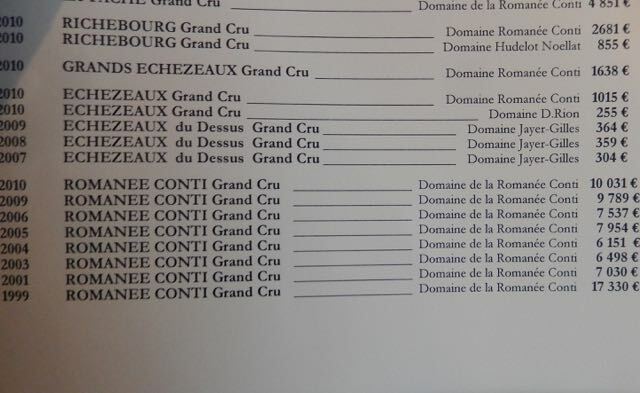 The better restaurants in France usually have a rather impressive wine list. In this case it wasn’t a list it was an entire book. While I did see a number of wines in our price range I decided to check out the Romanee Conti. I had to take this picture of the wine list. Are there really people who spend that kind of money for a bottle? 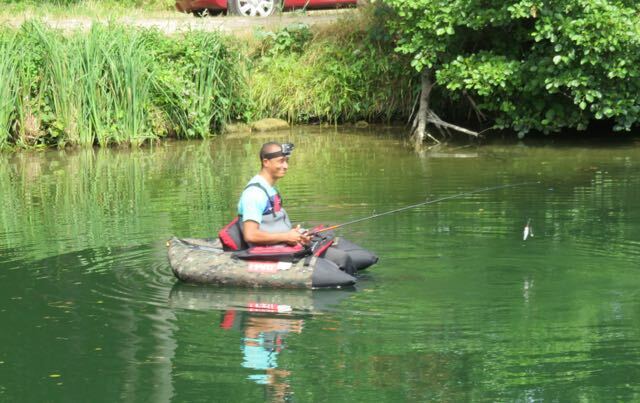 You don’t need a boat the size of Rabelo to enjoy the Yonne River. 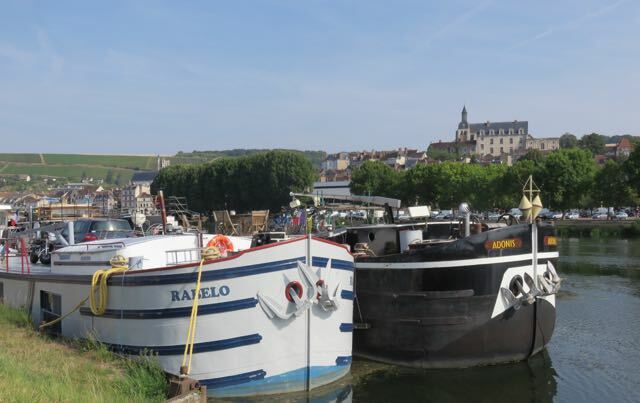 Rabelo and Adonis moored across from Joigny.